After removing the windowed side panel, you can see the internal design of the Cooler Master MasterCase SL600M. 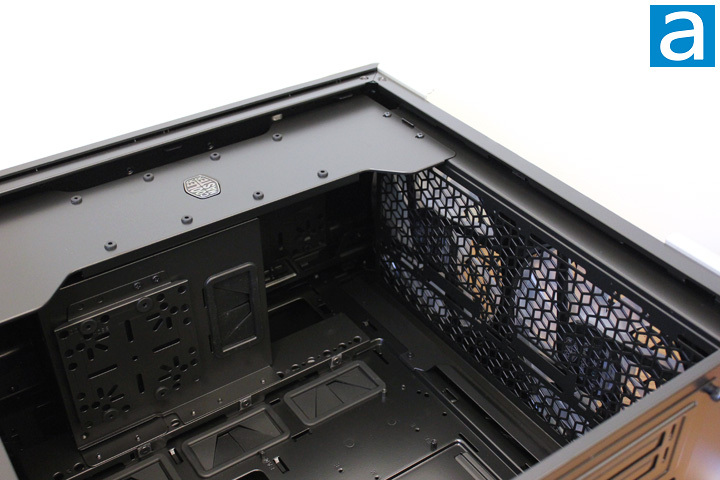 To be consistent with the computer case frame, the interior of the case is painted black. The paint is sprayed evenly inside the chassis. As I have mentioned earlier, the SL600M features vertical chimney effect layout for cooling. From the above photo, you can have a clear view of the vertical chimney effect design. From the bottom of the case, two 200mm fans pump air into the chassis. The cool air will first hit the graphics card and then the airflow will be used for the CPU cooling. If liquid cooling is used for the computer, the heated air will be expelled out through a maximum 360mm radiator on the top of the case. You may be wondering, “Where is the PSU chamber for the SL600M?” The PSU chamber is actually under the cover where you can see a Cooler Master logo. I will introduce PSU chamber later. As a mid-tower that pushes the size envelope, the Cooler Master MasterCase SL600M can support regular ATX motherboards, and of course, smaller boards such as mATX and mITX. I noticed all the risers were screwed on to the tray already from the factory. 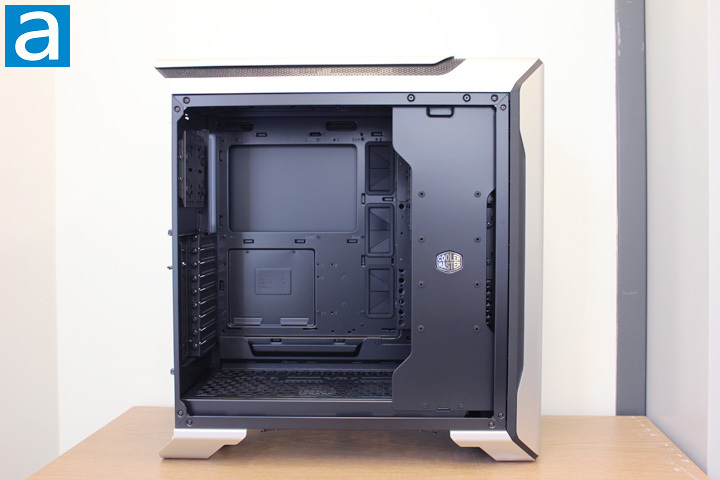 This computer case features one interesting unconventional design with a vertical chimney effect layout and a front top mount PSU. Thanks to the already installed motherboard risers, users can now focus more on how to mount the PSU instead of worrying about the positions of the motherboard risers. After putting the motherboard into position, the heatsink or water cooler block can then be easily installed and removed, thanks to the big rectangular opening on the tray. From the above photo, you can see there are two 200mm fans from the factory on the bottom of the case. 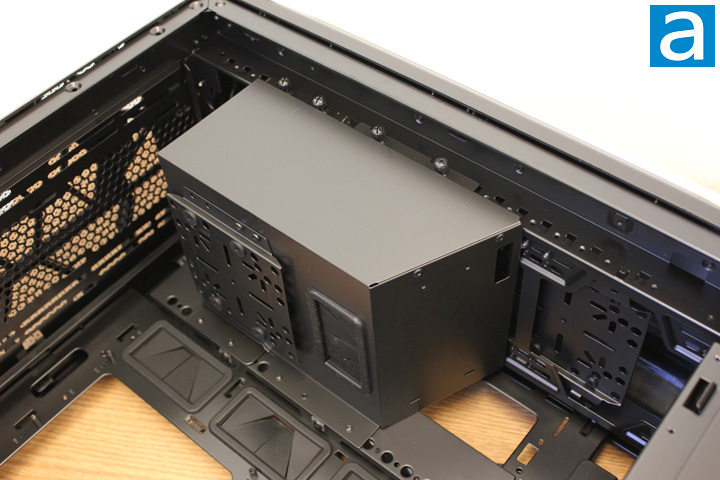 The expansion slot covers of the MasterCase SL600M feature a solid piece design for better dust prevention. 5.25" drive bays have been on personal computers since early 1980s. Now is the time to get rid of them, since we have the Internet, and for anything that requires physical media, there are USB flash drives. As such, Cooler Master completely removed the optical disc drive bay for the SL600M. In order to fit the PSU chamber behind the front panel, the conventional 3.5" drive mount rack is not present in this case here. Instead, hard drives can be mounted on the surfaces of the PSU chamber. In the above photo, you can see there are one combo 3.5" or 2.5" drive mounting racket on the PSU chamber and two SSD mounting places on the PSU chamber cover panel. In order to get access to the power supply chamber, the chamber cover panel needs to be removed. In the above picture, the cover is removed so we can see the enclosure itself. 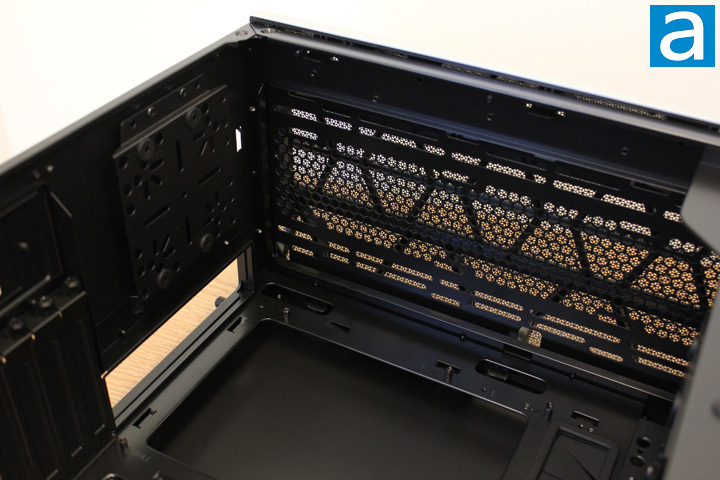 The power supply holder is removable and it is mounted on the computer case frame using four thumbscrews. There are two arrays of mounting holes for the chamber and as such, the mounting position and the length of the enclosure can be adjusted according to the size of your unit. Behind this box, a power cable is available to extend the power connector of the power supply to the back of the case. Basically, the chamber design of SL600M gives the user a high degree of freedom in terms of mounting the PSU in the case. Meanwhile, the space between the PSU and the front panel forms a ventilation channel. This photo above shows the details of the top cooling bracket. You can either install up to three 120mm or 140mm fans, or two 200mm fans. If you want to use liquid cooling, a 360mm radiator can be mounted on the top cooling bracket. Personally, I have not seen a 360mm radiator before, but it is nice to see this capability in the Cooler Master MasterCase SL600M. In the picture, you can see there are two different mesh patterns on the top cooling bracket. The coarse mesh is part of the chassis for the fans or radiator mounting. The fine mesh is actually the top panel, and it can prevent the dust from getting in the case while still provides good ventilation. Note I have already removed the aluminum top cover before taking this photo. There is also a combo 3.5" or 2.5" HDD mounting racket installed above the motherboard I/O shield opening. 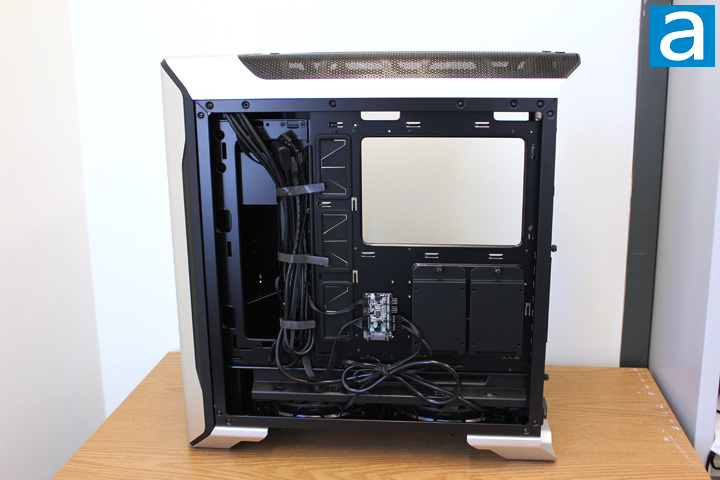 Since we do not have rear exhaust for this case, the empty place might as well be used for mounting drives. Upon removing the right side panel, you will see the other side of the motherboard tray. Two 2.5" hard drive trays are located under the motherboard tray opening for easy installation and removal of SSDs or other similarly sized accessories. Regarding cable management, Cooler Master did a fairly good job here, as there are tons of room for cables. Between the motherboard tray and the right side panel, the room for cable routing is about 25mm to 35mm, which is more than enough even for thick cables. According to the above picture, three Velcro straps are included along with a channel for better cable management. By the way, there are three openings with rubber grommets right beside the bunch of cables from the front I/O and switches panel. Your PSU power cable for motherboard can be safely routed to the other side of the motherboard tray. 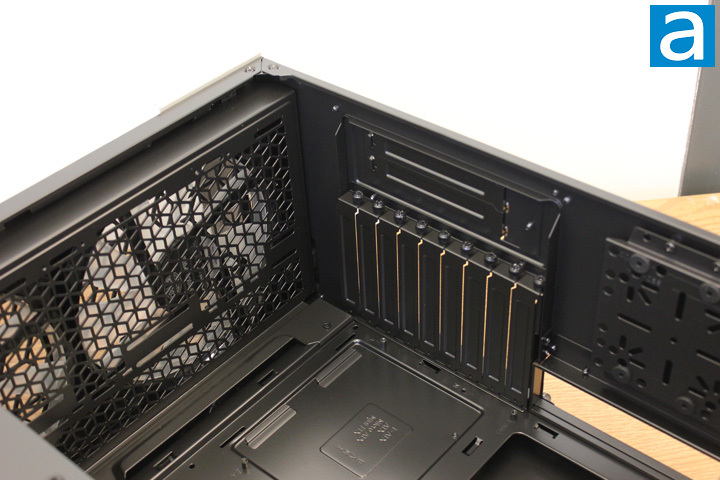 Generally speaking, the interior design of Cooler Master MasterCase SL600M is pretty good. All the components you need for building a computer can be nicely accommodated and kept cool. The unique PSU chamber design allows high degree of freedom in terms of installation. The paint job quality of the interior is great. More importantly, you do not to be an expert to route cables to do the job well, since there are plenty of room to do what you need to do. posted 3 hours and 13 minutes ago, with 1 posts. posted 3 hours and 14 minutes ago, with 8 posts. posted 3 hours and 19 minutes ago, with 11 posts.